tecon Systemtechnik offers a complete product portfolio for the custody and non-custody transfer measurement of gas volumes for industrial and commercial applications. Characterized by their extreme precision and robustness, the measuring instruments are calibrated and tested on approved flow and pressure test benches that are traceable to international standards. 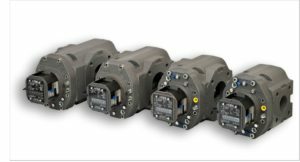 The rotary gas meters and turbine gas meters can all be equipped with various low and high frequency pulse outputs, as well as with encoders and/or MBus. All meters can be connected to various electronic evaluating instruments such as compact volume correctors, flow computers, data storage devices and data transmission devices for the automated determination of flow or gas volumes or volume conveyance. They can also be connected to devices from other manufacturers for a considerably broader range of applications.